Habibollah Latifi's scheduled execution in Iran has been put on hold, his lawyer says. A human rights activist says that there wasn't "any convincing evidence against him"
(CNN) -- The lawyer for a Kurdish-Iranian law student who was scheduled to be executed Sunday says the sentence has been halted, pending an investigation of what his legal team says are irregularities in the case, the semi-official Iran Students' News Agency reported. Human rights organizations had appealed to Iranian authorities to call off the execution of Habibollah Latifi, who is charged with security-related crimes. Drewery Dyke, a researcher for Amnesty International, later said that five members of Latifi's family were detained after the execution was halted in Sanandaj, a city in northwestern Iran. "The family's house was raided and five members were taken away including the father, an older brother and two sisters. The identity of the fifth person is not known at this time," he said. Latifi is one of at least 16 Kurds facing execution on various national security-related charges, including moharebeh -- which translates to "enmity against God" -- according to published reports. 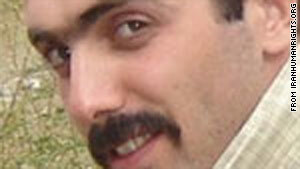 His lawyer had been told previously by Iranian authorities that Latifi would be hanged Sunday at the Sanandaj Prison. Latifi, a law student at Azad University, was arrested in 2007 in the western Iranian province of Ilam for his alleged role in an attack on a police station in Kurdistan province and attempted assassination of a prosecutor on behalf of the anti-revolutionary group Kurdish Independent Life Party. He was convicted and sentenced to death the following year by the Sanandaj Revolutionary Court. Iran's penal code states anyone found taking up arms against the state, or belonging to an organization who violently attacks the government, may be considered guilty of moharebeh and sentenced to death. Joe Stork, deputy Middle East director at Human Rights Watch, said that Iranian intelligence agents tortured Latifi and a court sentenced him to death "without any convincing evidence against him." "The circumstances surrounding Latifi's arrest, detention, and conviction strongly suggest that the Iranian authorities have violated his fundamental rights," Stork said.